Special counsel Robert Mueller's report concluding the Russia investigation was delivered by a security officer early Friday afternoon to the office of Deputy Attorney General Rod Rosenstein. It was then delivered within minutes to Attorney General William Barr, who has said he will provide updates on Mueller's still-confidential findings to Congress as soon as this weekend. Barr notified the House and Senate Judiciary Committees that the report had concluded in a letter delivered Friday afternoon. Read the attorney general's letter below. I write to notify you pursuant to 28cfr section 600.9 (a3) that special counsel Robert S Mueller III has concluded his investigation of Russian interference in the 2016 election and related matters. In addition to this notification, the special counsel regulations require that i provide you with a description and explanation with instances (if any) in which the Attorney General or "acting attorney general" concluded that a proposed action by a special counsel was so inappropriate or unwarranted under established Departmental practices that it should not be pursued " 28cfr sec 600.9 (a)3. There were no such instances during the special counsels investigation. The Special Counsel has submitted to me today a "confidential report explaining the prosecution or declination decisions" he has reached, as required by 28 CFR section 600.8C. I am reviewing the report and anticipate that i may be in a position to advise you of the Special Counsels principal conclusions as soon as this weekend. 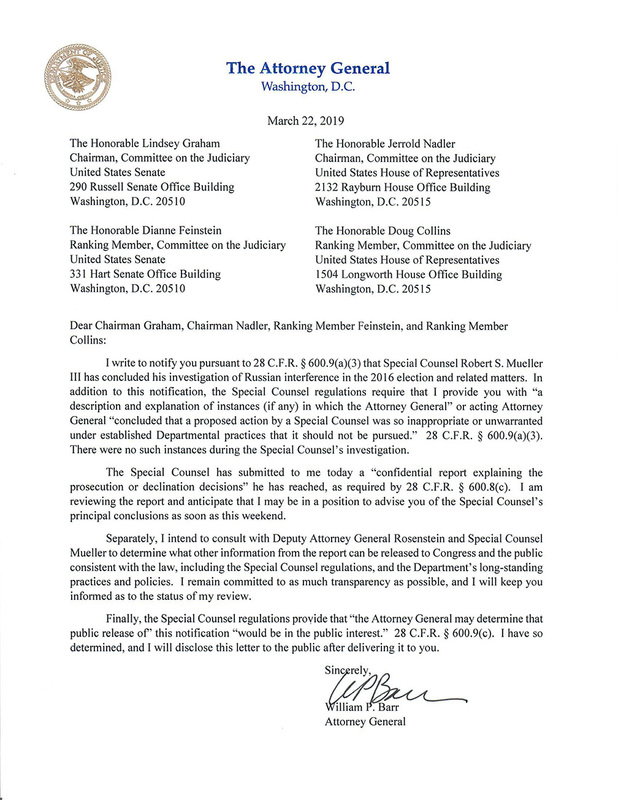 Separately, I intend to consult with Deputy Attorney General Rosenstein and Special Counsel Mueller to determine what other information from the report can be released to Congress and the public consistent with the law including the Special Counsel Regulations, and the department's long standing practices and policies. I remain committed to as much transparency as possible and i will keep you informed as to the status of my review. Finally the Special Counsel regulations provide that "the Attorney General may determine that public release of" this notification "would be in the public interest" 28CFR 600.9c. I have so determined and i will disclose this letter to the public after delivering it to you. When President Donald Trump’s former campaign chairman Paul Manafort was convicted on eight felony counts on Aug. 21, 2018, he became the first member of Trump’s campaign to be found guilty. Several other Trump associates have pleaded guilty, including the president's former personal attorney Michael Cohen, who did so within minutes of Manafort’s conviction, and again on Nov. 29, 2018. On Jan. 25, 2019, Roger Stone became the sixth Trump aide to face criminal charges. The seven-count indictment against Stone, Trump's long-time confidant, accuses him of witness tampering, obstruction and false statements about his interactions related to WikiLeaks. Click each photo to learn more. 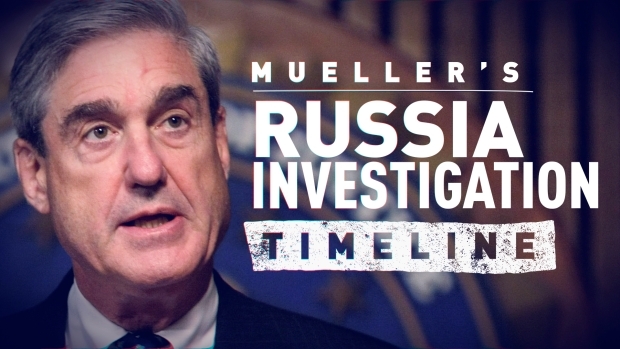 On May 17, 2017, former FBI Director Robert Mueller was appointed special counsel to oversee the investigation into possible links between Russia and the Trump campaign. He secured the conviction of one Trump associate, guilty pleas from several others and the indictment of Russians who allegedly interfered in the 2016 election.